Since my last rover update on November 14th, Curiosity moved relatively little. They drove a short distance to the southeast to a point where they wanted to drill, but have not moved from this location for the past two weeks because of drill issues. While the engineers study the drill problem, which requires them to not move either the rover or the drill arm, the scientists have still used Curiosity to take images of the dust in the sky, to take hourly images of the dust on the ground (to see how it is changed by the wind), and to take images of nearby interesting nearby features (below the fold). When they will move again remains up in the air. The drill issues are serious and must be understood, since there is a design flaw in the drill’s electrical system that causes intermittent short circuits and if not carefully handled could actually short out the rover’s entire electrical system and end the mission. Not that Curiosity will never move again. There are two possibilities. The more likely one will be that they will figure out the issues now, drill the hole as originally planned, and then move on. If they fail to solve the problem, they will then forego drilling now (and maybe in the future as well), and move on immediately. 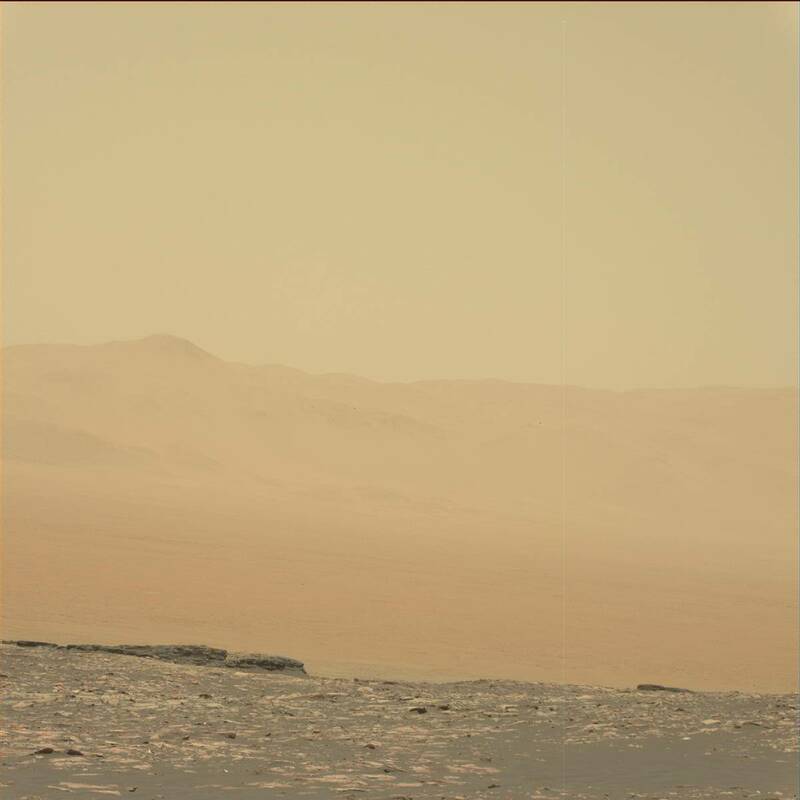 Either way, expect them to head south and southeast, picking their way through the dust field, aiming for Mount Sharp. 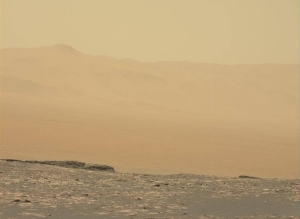 My guess as to Opportunity’s future course in my November 14th update, was somewhat wrong. 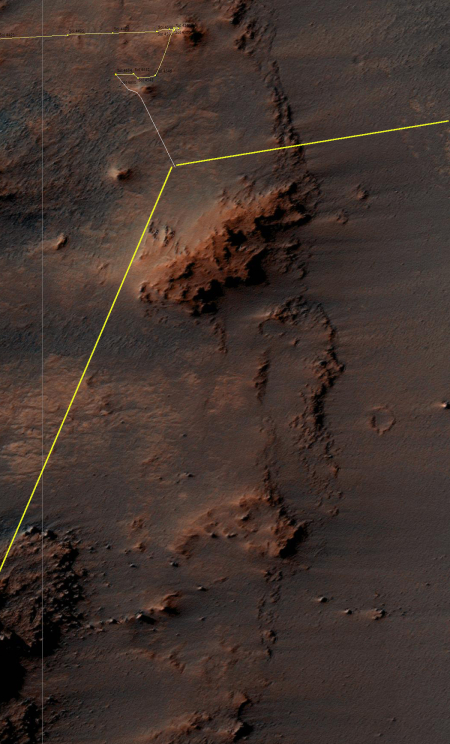 The image to the right has been annotated by me to show Opportunity’s travels through Sol 4569. Instead of heading south they went west to circle around the next mound, which they dubbed Pompys Tower. 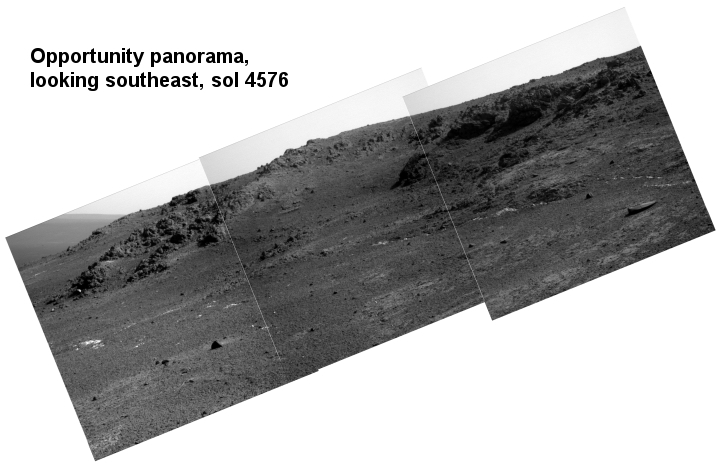 I have also annotated the image to show the approximate view of the panorama below, taken by Opportunity’s panoramic camera on Sol 4576. It appears the science team is carefully studying the ridge before them with possibly the intent of moving closer to it to study it better. This very detailed Opportunity update from the Planetary Society says that their primary goal now is to drive south to the gully where they will then descend into the floor of Endeavour Crater. 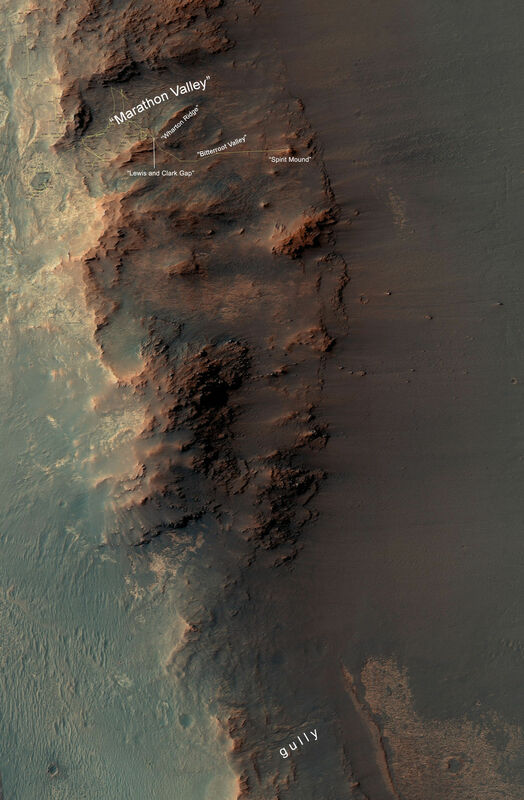 That gully is quite a distance south, and is likely not easily reached traveling through the rough terrain inside the rim of the crater, where Opportunity presently is. To reach it, they will probably have to find a route out of the rim to the west and skirt the rim as they move south. 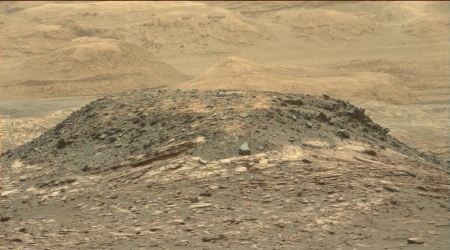 The panorama below however suggests otherwise, that the science team is reluctant to leave the interior of the rim, where they are finding older, more interesting geology. It suggests they are considering weaving their way south within the rim. The trip will be slower, but the data obtained more interesting. The panorama however does reveal one problem they have traveling within the rim. This image has been rotated to show the actual slope that Opportunity is on. At 22 degrees, it is quite steep. So far the rover is handling it, helped for sure by the one-third Martian gravity. Nonetheless, it is an issue they have to face if they stay within the rim as they move south. Interesting that two serious “design flaws” should crop up in two different Mars missions in the same week. Luckily neither is an EOM level problem but both will seriously affect future operations. Bob, thanks for the Rover updates. A great way to stay updated on their movements. 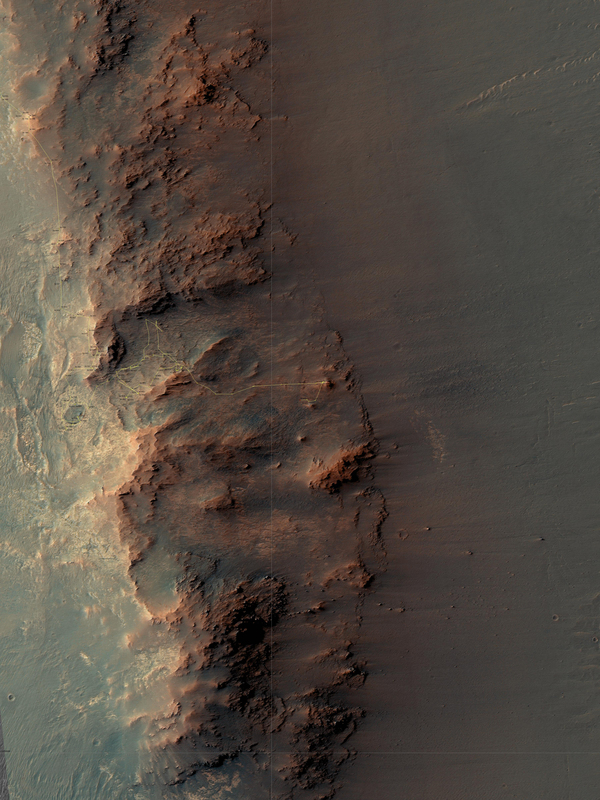 I am continually in awe of the Opportunity rover’s amazing mission. The only thing better would have been if Spirit were still working as well. Bob, interesting as always…if you are up for it, I’d like some clarification re: Mar’s atmospheric pressure near ground level…The story seems to be its pressure is around 100,000 feet earth altitude. If that is true , its , practically speaking , near vacuum. When viewing footage at these altitudes of operation high drop , or felix baumgardener HALO drops, there is not even a hint of a ruffle of wind against the space suit. IF this is reasonably accurate, I don’t get all the hype about the danger of Mar’s windstorms to a suited Astronaut. Sure, I get the problems with soot / fines , and dirt , static electricity , etc etc., but I’ve read , that even a 60 mph windstorm ( earth equivalent of a tornado f1}, wind be like a very gentle breeze you could barely feel..whats the scoop on this? 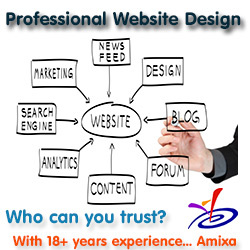 Thanks for you thoughts on this…. Orion314: I think you are correct. The problem isn’t the strength of the wind, but of the material itself that the wind is carrying. And it isn’t that the Martian dust would damage equipment because of the impact, but because it can enter and clog equipment. I believe the rough conversion-ratio for “wind on Mars” is something like 10 to 1. The amounts/sizes of particulate that can be picked up by the Martian wind, varies with speed and the underlying geology, and the whole gravity thing. Is this what enclosures will be made of on the moon or Mars?